How can you take action? Many NGOs are involved in forest protection worldwide. They offer concrete solutions through different initiatives, green tips and campaigns as a call to action. Pilai Poonswad, 64, has managed to turn poachers and illegal woodcutters into guardians of nature to protect hornbills. This rare tropical bird is hunted for its meat and its casque. This project aims to test strategies intending to reduce CO2 emissions resulting from deforestation and forest degradation. The activities conducted will aim to reduce the rate of forest extinctions and restore some damaged forests by 2010. The project's objective is also to improve the living conditions of the local population by giving them direct responsibility for managing forests and natural resources —as much inside as outside the protected areas— by promoting and developing sustainable agricultural practices and by generating additional revenue for the people. This project is funded entirely by Air France. 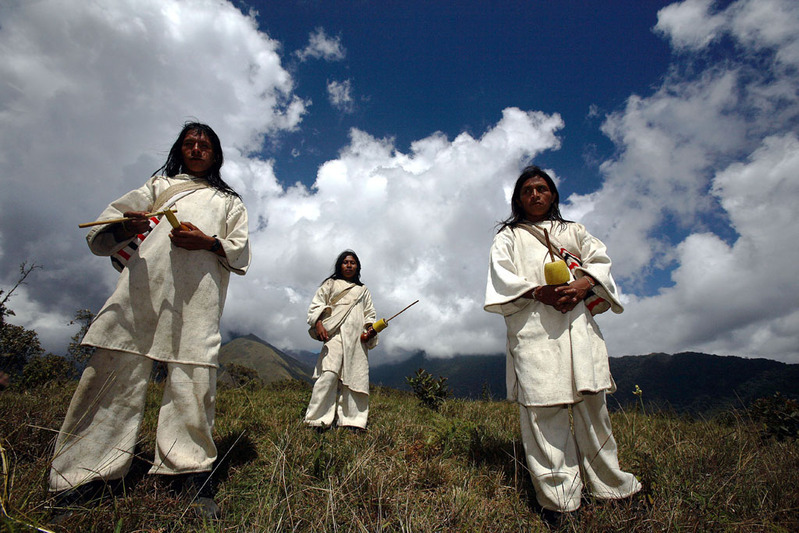 Tchendukua buys land in the Sierra Nevada to give it back to Kogi Indians so that they can return to their ancestral land and preserve the forests. Buying sustainably grown teak . Floresteca, the biggest private teak plantation in the world, is recognised by the (Forest Stewardship Council) for its sustainable management. The farm, located in the Mato Grosso region in Brazil, is the result of a collaboration between a Dutch company and several Brazilian companies. Cambodian Buddhist monk with an environmental crusade / In what began as a Cambodian Buddhist monk’s mission to thwart the destruction of the environment has resulted in the legal protection of 18,261 hectare of evergreen forest in northwestern Cambodia, now called the Monks Community Forest. Reforestation in Borneo / The island of Borneo is experiencing heavy deforestation . The Indonesian government has therefore set up a reforestation program in an area where the primary forest was cut down and the soil was burnt. Professor Willie Smits and the Borneo Orang-utang Survival Foundation (BOS) therefore replanted more than 1 300 varieties of tree on 2 000 hectares by using natural excrement-based and food waste-based fertilizers. Whilst the forest in this area normally has difficulties growing back when it has been cut, the results are spectacular : many kinds of trees have reappeared. Marc Ona Essangui, who won the Goldman Environmental Prize in 2009 for his fight to preserve the Ivindo National Park in Gabon, talked to GoodPlanet Info about his association’s (Brainforest’s) activities and especially, the part it played in the Belinga affair. This name refers to a mining industry project to build a mine, a dam, a railway, a road and a deep-water port at the heart of the Ivindo National Park in the North-East of Gabon near the Kongou Falls which are amongst the most beautiful in Africa. MCDI helped two forest communities in Tanzania to obtain FSC certificates for their forests and manage them sustainably. This includes sustainably managing the local wood, dalbergia, which is highly sought after in the West for making musical instruments. In Tanzania, Sebastian Chuwa has devoted his life to breathing life back into the M’pingo tree, a local ebony tree that the local population has been massively cutting down for 20 years. It used to abound in all Africa’s dry savannah but now there are only less than 3 million of them. Most of these are in Tanzania and Mozambique. Thanks to Sebastian Chuwa's action, over a million trees have been replanted and he has convinced the local craftsmen to replant more trees than they cut. In 2004 alone, 30 000 trees were planted. This is a major success as 20 000 odd M’pingo trees are cut down every year for commercial purposes and it takes this tree between 70 and 100 years to mature. "Green charcoal" in Senegal / To produce green charcoal from agricultural residues or from renewable biomass following a process known as pyrolysis. This domestic fuel stems the increase in deforestation and CO2 emissions. This project foresees to avoid the emissions of approximately 5 000 tons of CO2 in the atmosphere. In 2009, Haïdar El Ali managed to gather 80 000 volunteers to replant 36 million young mangrove shoots. In 2010, he aimed to replant 100 million. He also created a 7000 ha Marine Protected Area by closing an 18 km branch of the Bamboung bolong. Trees against the desert / To fight the consequences of desertification, several green belt projects – tree plantations - have been carried out in the world. In 1972, in Kenya, Wangari Maathai launched the « Green Belt Movement » to fight the negative effects of droughts and large plantations meant for export such as coffee and tea. In about twenty years, thanks to a solid tree network, more than 20 million trees have been planted in Kenya thus curbing desertification there. This initiative earned Wangari Mathaai the Nobel Peace Prize in 2004. Gordon Sato planted over a million mangroves on the banks of the Red Sea to lower poverty and hunger. This desert region had been ravaged by several years of war. The Canadian company Triton Logging Inc has developed a saw which can cut tree trunks underwater up to 300 metres deep. Indeed, more than 300 million trees have been flooded at the bottom of the reservoirs of hydroelectric dams. The wood which is gathered has is specially certified. Its quality means it can be used for construction as well as for furniture. The saw’s motor functions with vegetal oil and solar power. In May 2010 in Canada, nine major environmental groups, including Greenpeace and the David Suzuki Foundation, signed an historical agreement with 21 forestry companies, who agreed to suspend logging activities in nearly 29 million hectares of pristine boreal forests. An article in the Wall Street Journal on July 1, 2009, explained that the United States had agreed to write off $30 million in debt owed by Indonesia. In exchange, Indonesia must protect Sumatra's forests. Indonesia will therefore have to spend the same amount in the form of subsidies for the conservation of 13 endangered Sumatran forests. An extra 1 million dollars of aid will be provided by Conservation International, an American organisation for the protection of nature. "It is a huge encouragement for Sumatra's population and wildlife" , declared Jatna Supriatna, the vice-president of Conservation International Indonesia, "which reflects the United States' provisional policy". It is the biggest exchange for a debt write-off that the American government has ever organised. Sumatra is an island on which there are many threatened species such as white rhinoceros, orang-utans and tigers, etc. With its high deforestation rate, Indonesia is the third biggest greenhouse gas emitter after the united States and China. The billionaire Douglas Tompkins who created the brands Esprit and The North Face, buys thousands of hectares of land in South America, He then turns this land into natural reserves. He now owns over 8 000 km2 of land. "A Forest Protection Agreement between Guyana and Norway – On Monday 16 November, Norway signed an agreement with Guyana for it not to cut its trees, in exchange for 250 million dollars by 2015. To start with, Guyana will receive 30 million dollars. It will receive the rest if the project manages to avoid deforestation, explained an article published on the 17 November on the WorldWatch Institute website. For years, the Guyanese authorities have been trying to obtain funding to fight deforestation and thus reduce greenhouse gas emissions. The money given by Norway is similar to the REDD mechanism (Reduction of emissions from deforestation and forest degradation in developing countries) over which an agreement must be reached in Copenhagen. REDD consists of paying developing countries to not exploit their forests. The Post Office launched the « For the planet » eco-friendly stamp book at the beginning of 2007. This book of 12 stamps replaced the book of 10 stamps and is almost the same size. This operation saves 12 tons of paper a year; this is the equivalent of 192 trees. The unbleached kraft paper comes from sustainable forests. The glue is solvent-free and water-based. You can make 800 kg of recycled paper out of one ton of old paper and each sheet saves 1 litre of water and 2.5 Wh of electricity as well as 15 g of wood. This is how more than 22 million tons of paper are saved every year in France due to cardboard being recycled. Certification is a means of being sure of where wood comes from thanks to a label which helps everyone spot a product which is eco-friendly. Among the existing labels, the FSC's (Forest Stewardship Council) has already been awarded to more than 84 million hectares of forest in the world. This label depends on 10 criteria of sustainable eco-friendly forest management; forest management which respects the environment and the local population whilst leaving the forest enough time to renew itself. 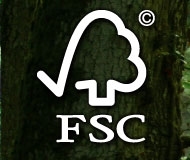 The FSC label exists since 1993 and can be found on numerous objects which can be traced. On September 18, 2010, the Steering Committee animated by François Letourneux, the president of UICN France, unanimously adopted its report on the feasibility and opportunity of creating a national park on the Fontainebleau forest. The report’s conclusion is clear: this process must be undertaken within a public interest group that will be able to take the thought process further and prepare the creation of a national park. In 2010, the Fondation Chirac started explaining the architects’ responsibility to use certified wood to 20 000 architecture students. Architects use the most wood along with buildings and public works. They can therefore help inform people about using legal certified wood. This website by the WWF explains the impact of our consumption (paper, food, jewellery) on forests and offers concrete solutions to reduce this impact. The British non- governmental organisation, Cool Earth, uses the donations it receives to buy tropical forests in Brazil, Guyana and Ecuador. The private property thus becomes a way of respecting the environment, as these forests which are managed by associations are not under pressure from forestry companies. The other major advantage: preserving trees helps store carbon. Over 400 000 hectares of forest are being preserved like this in Guyana. Sign the petition for cork and choose bottles with corks. The increasing number of screw caps on wine bottles instead of cork ones is threatening 2 million hectares of forest in Portugal, Spain, Italy and North Africa. Industrial exploitation of this wood plays a big part in the prosperity of cork forests. This has ensured the preservation of these spaces for centuries. WWF estimates that up to three quarters of these forests could be lost if screw caps, which have already increased on the wine market over the past 10 years (up from 5 to 30%), keep gaining ground. If this happens, producers will leave cork behind and plant eucalyptus trees, which don’t come from this region. This upheaval could endanger the survival of several species that live in these forests – several birds as well as the Iberian lynx which is under threat of extinction. Greg L’Estrange, the new CEO of Gunns Limited, one of the world's industrial giants, has decided to stop logging native forests in Tasmania as his company has been doing for several decades. For all the Australian environmental groups who have been campaigning against the destruction of the Tasmanian forest, it is an unprecedented decision : ""we now have a unique opportunity to resolve the Tasmania forest conflict"", rejoiced Phill Pullinger, the director of one organisation. His NGO, Environment Tasmania, as well as two others, the Wilderness Society and the Australian Conservation Foundation, have began talks with forest industry representatives so that the forest in Tasmania can be managed sustainably. A conflict that has been going on for dozens of years could thus be resolved. One of the techniques used involves burning native forests with napalm to replace them with industrial eucalyptus plantations as they grow fast and their trunks are well suited for machines. Tai Butani is the only person left in Lomawai village who continues to produce salt from the mangrove ponds, a tradition that has been part of village life for generations. Lomawai village on the Island of Fiji, and is well-known for its salt producing tradition. 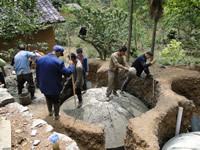 UNDP Global Environmental Facility Small Grants Programme co-funds a project started in 1999 by the World Wildlife Fund. This project has allowed Tai Butani to conduct workshops and pass on her knowledge to local women. "The Billion Tree Campaign - Growing Green / The Plant for the Planet: Billion Tree Campaign is a worldwide tree planting initiative facilitated by the United Nations Environment Programme. People, communities, businesses, industry, civil society organizations and governments are encouraged to enter tree planting pledges on-line . The campaign strongly encourages the planting of indigenous trees and trees that are appropriate to the local environment. By the end of 2009, more than 7.4 billion trees had been planted under this campaign – far in excess of the year-end target of 7 billion – by participants in 170 countries. With this success continuing into 2010, the Billion Tree Campaign will make a substantial contribution to the 2010 International Year of Biodiversity, raising awareness of the importance of biodiversity for our well-being. Trees play a crucial role as fundamental components of the biodiversity that forms the foundation of the living networks and systems that provide us all with health, wealth, food, fuel and vital ecosystem services our lives depend on. They help provide breathable air, drinkable water, fertile soils and a stable climate. The billions of trees planted by the collective efforts of participants of the Billion Tree Campaign from all parts of society will contribute to biodiversity across the planet.